Got to sleep in until my alarm (a.k.a. my 100 lb. dog Khaleesi) woke me up. Gotta love weekends. And dogs. Especially large dogs. Spent the morning at Hawk Island Park where I got to cheer on several friends at the Come Clean Duathlon, including a couple of my Black Girls Run! Lansing team mates who were looking good as they started their biking leg. Bonus: Got to see my friend Jef Mallett who’s kind of a big deal. He’s the creator of the Frazz strip. And if you haven’t seen it, please check it out. You’ll thank me later. Like Jef, Frazz is very active and in addition to being an overall great strip, there are lots of running inside jokes. Jef and I worked together a million years ago at what was then the Booth Newspapers Lansing Bureau. I even saw some of the very first Frazz cartoons. Always a talented artist, Jef is also a triathlete and an Ironman. And an overall awesome guy. Between all the picture taking and catching up, I did manage to run three miles along the boardwalk. With a few stops. OK, a lot of stops since I started and stopped to talk to several friends. Gotta love runners. 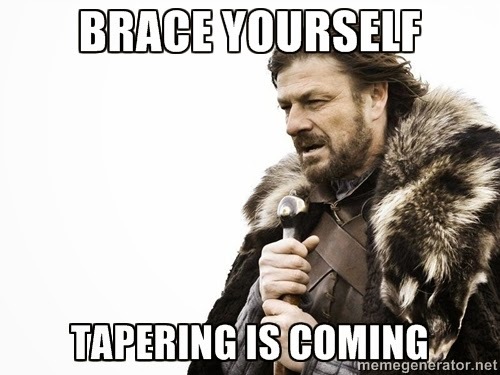 I’m OK with that since, remember, I’m tapering. In the meantime, trying to convince my husband to buy us some used road bikes so we can do this race together next year.